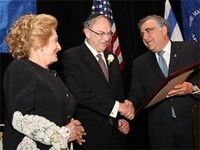 Rabbi Hyman and Ann Arbesfeld, longtime supporters of YU, were honored by President Richard M. Joel. Mar 26, 2009 — The Yeshiva University High Schools Annual Dinner of Tribute at the Grand Hyatt Hotel in New York City on March 22 honored Rabbi Hyman and Ann Arbesfeld, YU Benefactors with deep roots in the YU community. Rabbi and Mrs. Arbesfeld endowed the Abraham Arbesfeld Kollel Yom Rishon and the Millie Arbesfeld Midreshet Yom Rishon in memory of Rabbi Arbesfeld’s parents. They also established a Kollel Fellowship at YU’s Rabbi Isaac Elchanan Theological Seminary (RIETS) in memory of Ann’s parents, Benjamin and Rose Berger. Rabbi Arbesfeld graduated from Yeshiva University High School for Boys (YUHSB) and Yeshiva College, and received semikhah [ordination] from RIETS. Mrs. Arbesfeld served as the president of YU Women’s Organization for 10 years and continues her involvement as a member of its executive council. The Arbesfeld children are alumni of YUHS and the Arbesfeld grandchildren currently attend the high schools. The program also singled out the hard work of two faculty members: Rabbi Baruch Pesach Mendelson, in his bar-mitzvah year at YUHSB, and Deena Rabinovich at YUHSG. Rabbi Mendelson serves as the rebbe of the Advanced Honors Masmidim track in 11th grade at YUHSB. He was awarded the Joseph S. and Caroline Gruss Excellent Teachers Fund Award and the Grinspoon-Steinhardt Award for Excellence in Jewish Education from the Board of Jewish Education of Greater New York. Mrs. Rabinovich serves as the YUHSG Israel guidance coordinator and teaches Chumash to the 11th grade. A graduate of Stern College for Women, she is an EdD candidate at YU’s Azrieli Graduate School of Jewish Education and Administration. Mrs. Rabinovich is a 2007 recipient of the Grinspoon-Steinhardt Award for Excellence in Jewish Education and the 1996 Joseph S. and Caroline Gruss Excellent Teachers Fund Award. I just want to say I’m newbie to blogs and actually enjoyed this blog site. Most likely I’m likely to bookmark your website . You amazingly have perfect stories. Regards for sharing your web-site. I just want to mention I am just all new to blogging and definitely loved you’re web blog. Very likely I’m likely to bookmark your blog post . You definitely come with good well written articles. Thank you for sharing your website. I just want to tell you that I am just very new to blogging and absolutely enjoyed your web-site. Almost certainly I’m planning to bookmark your site . You definitely come with great articles. Appreciate it for sharing your web page. I just want to say I’m beginner to blogging and actually loved this website. Very likely I’m likely to bookmark your blog . You definitely have terrific article content. With thanks for sharing your webpage. I just want to mention I am just all new to blogging and absolutely loved this web page. More than likely I’m planning to bookmark your blog post . You really come with great articles. Thanks a bunch for sharing your web site. I simply want to say I am just newbie to weblog and definitely enjoyed you’re blog. More than likely I’m likely to bookmark your blog . You certainly come with amazing stories. Many thanks for sharing your webpage. I just want to mention I am beginner to blogs and really enjoyed your web site. Very likely I’m likely to bookmark your blog post . You certainly have really good stories. Many thanks for sharing with us your blog. I just want to mention I’m beginner to weblog and actually enjoyed you’re blog site. Likely I’m likely to bookmark your site . You certainly have amazing article content. Cheers for sharing with us your website page. I just want to tell you that I’m all new to blogs and absolutely liked you’re blog site. Likely I’m want to bookmark your blog . You absolutely come with great articles and reviews. Regards for sharing your web site. I just want to say I am very new to blogging and site-building and actually loved you’re page. Probably I’m likely to bookmark your site . You certainly come with excellent articles and reviews. Thanks for sharing with us your blog site. I simply want to say I’m beginner to weblog and absolutely loved your web site. Almost certainly I’m want to bookmark your blog . You absolutely have very good articles. Bless you for revealing your web site. I just want to mention I’m all new to blogging and honestly liked you’re blog site. More than likely I’m planning to bookmark your website . You actually come with really good posts. Thanks a bunch for revealing your website. I just want to mention I am very new to blogs and definitely liked you’re website. Most likely I’m going to bookmark your blog post . You definitely have awesome articles. Regards for sharing with us your website page. I simply want to tell you that I am very new to weblog and certainly liked you’re web site. Likely I’m want to bookmark your blog post . You absolutely come with exceptional posts. With thanks for sharing with us your website page. I simply want to mention I am new to blogs and actually savored your blog site. Very likely I’m going to bookmark your blog post . You actually come with really good article content. Thanks a lot for sharing your website page. I just want to tell you that I am just all new to weblog and really savored your web page. Very likely I’m going to bookmark your blog . You really come with perfect articles and reviews. Thanks a bunch for sharing your website page. I just want to mention I am new to weblog and actually liked your web-site. Likely I’m planning to bookmark your website . You absolutely have good well written articles. Kudos for revealing your website page. I just want to say I am just beginner to weblog and seriously loved you’re web-site. More than likely I’m want to bookmark your site . You absolutely have amazing article content. Bless you for sharing your web-site. I just want to tell you that I’m newbie to blogging and truly loved your web site. Very likely I’m going to bookmark your blog . You absolutely have outstanding article content. Thanks a bunch for sharing your web page. I just want to tell you that I’m new to blogging and seriously liked your website. Very likely I’m planning to bookmark your blog post . You certainly come with awesome writings. Appreciate it for sharing your webpage. I simply want to say I’m all new to blogging and seriously loved your web blog. Probably I’m planning to bookmark your website . You really have beneficial stories. Bless you for sharing with us your webpage. I simply want to say I am just newbie to weblog and absolutely enjoyed you’re web-site. Most likely I’m want to bookmark your website . You actually come with good well written articles. Thank you for revealing your web page. I simply want to tell you that I am just new to blogging and site-building and seriously enjoyed your blog. Probably I’m planning to bookmark your website . You absolutely have terrific posts. Regards for sharing with us your webpage. I simply want to tell you that I am just beginner to blogs and truly loved you’re website. Almost certainly I’m likely to bookmark your site . You actually come with remarkable writings. Appreciate it for sharing your web site. I just want to tell you that I am just all new to weblog and certainly liked this web-site. Very likely I’m want to bookmark your blog . You definitely come with awesome well written articles. Thanks a lot for sharing with us your website page. I simply want to tell you that I am just newbie to blogging and site-building and absolutely loved this web page. Likely I’m planning to bookmark your site . You absolutely have terrific articles and reviews. Thank you for sharing your web site.